Here is a list of best free video rotator software for Windows. These freeware let you rotate video clockwise or anticlockwise by certain angle and save the rotated videos. While most of these video rotators let you rotate videos by 90°, 180°, 270°, etc., a few of them let you manually enter degrees of rotation. Some of them even support keyframing, which lets you add animated transition to rotation of a video. You can rotate a specific part of video using this feature. One of these software also lets you rotate different parts of a video by applying different parameters of rotation. You can also flip a video horizontally or vertically using these software. Also, these let you customize other parameters, like: anchor point, zooming option, scale, X offset, Y offset, etc. Most of these video rotators support common video formats to import and export. These formats include MP4, FLV, MKV, MOV, AVI, MPEG, WMV, OGG, WEBM, 3GP, and many more. Most of these software are full-fledged video editors which let you create impressive videos by editing and annotating them. You can trim a video, crop it, resize it, add transitions, effects, text, media files, etc., and do much more. Some of them are video converters which let you convert a video to another video format while customizing some output parameters, like: size, quality, aspect ratio, frame rate, add watermark, etc. I have a few favorite video rotator from the list. VSDC Video Editor is the favorite one, because it lets you rotate specific parts of a video by specific different rotation angles. I like HitFilm Express, Express Animate, and DaVinci Resolve as well because all of these let you add motion transition to rotation of your video by using keyframing option. If you need a software to simply rotate a video, Free Video Flip and Rotate is a good option. You can also checkout the list of best free Video Converters, Video Editors, and Software To Flip Videos for Windows. VSDC Video Editor is a popular video editor which also lets you rotate videos. To simply rotate a video in increments of 90 degrees (clockwise/anticlockwise), go to Editor > Tools, and select desired option. It also lets you flip video horizontally or vertically. To rotate a portion of video, you can go to Editor > Video Effects > Transform > Rotate. A pop-up window opens up, which lets you decide the specific part of the video you want to rotate. You can set the duration for the rotated part. Using this option, the rotation is done in increments of 30 degrees. So, you can specify angle as 30, 60, 90, 120, etc. This video rotator supports a good range of input and output video formats, like: AVI, MPG, MOV, FLV, SWF, WMV, RM, and MKV. 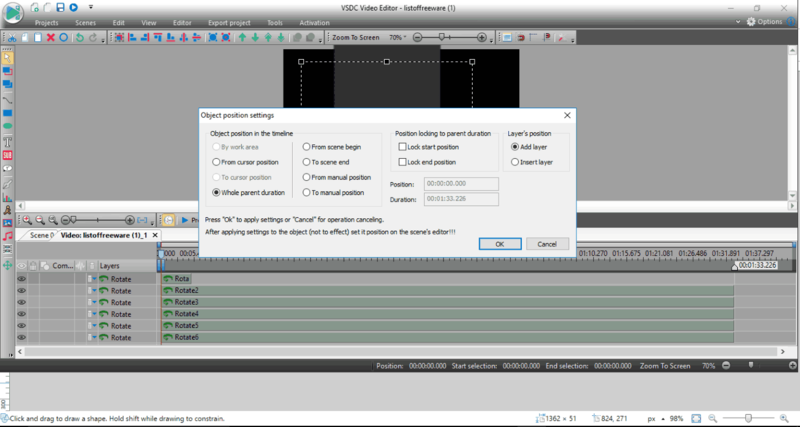 VSDC Video Editor provides various features to edit as well as annotate videos. You can add visual effects and filters, trim a video, set a different layout styles, add text, media, audio, and do much more. HitFilm Express is another great video editor which lets you rotate videos. To normally rotate a video, add it to the timeline, go to Controls > Rotation, and use the clock to set the degrees of rotation. You can even hold the video and rotate it using mouse. You can also add animated transition while rotating your video. For that, select the video. You will see an option Make Composite Shot, click on it, you will see different editing options. Just go to Transform > Rotation, and put the pointer at the start and the end of the part of the video to add keyframing. Now, hold the video to rotate it. The output will show motion while rotation happens by selected degrees. You may also change the scale, position, and anchor point of the video. To import videos, it supports various video file formats, like MP4, AVI, MPEG, MOV, M2T, M2TS, MTS, MXF, DV, HDV, WMV, etc. The output video can be saved in formats like: MP4, AVI, and image sequence. You can also upload output videos to YouTube directly. This free video rotator is a fully featured video editor with advanced editing tools, like: VFX effects, quick transitions, motion tracking, video clip trimmer, loop keyframes, opacity keyframes, audio keyframes, layer compositing with unlimited videos, and many more. Express Animate is another freeware to rotate videos. When you add a video file, you can see Rotation on its timeline (highlighted in above screenshot). You can manually enter the degrees or hold Ctrl key to rotate your videos. Not just simple rotation, you can also use keyframing option (highlighted in circle in above screenshot) to add animated rotation. To do so, you can add animation keys at the starting and ending of the video. If you wish to rotate a specific part of the video, select that part, and you can simply add animation keys at start and end of that part. Keyframes can be applied to other objects and parameters too. This video rotator is a free video editor which lets you edit videos as well as annotate them. It supports popular input and output formats, like MP4, MKV, 3GP, MPEG, MOV, OGV, etc. You can upload the output video to YouTube directly or save it to disc. You can even save it as an Image Sequence. DaVinci Resolve is an advanced video editor which lets you rotate video. It is actually a very comprehensive video editor, that is not too easy to use. To simply rotate video in DaVinci Resolve by certain degrees, add a video, drag it to the timeline, click on it. A section of different editing options will open up. Go to Transform > Rotation, and use the slider or manually enter the degrees to rotate the video. This video rotator also supports keyframing, i.e. you can see the motion of rotation of a video. Simply click on the keyframe option (pointed in above screenshot) and set the pointer to desired point where you want the rotation to start from. DaVinci Resolve provides some advanced video editing tools. You can insert objects on the videos, trim videos, slip multiple shots, slide multiple shots, superimpose, swap edits, zoom videos, shuffle edits, overwrite editing, append editing, etc. But if video rotation is the only feature you are looking for, DaVinci Resolve might be an overkill for that. Free Video Flip and Rotate is a freeware to flip and rotate videos. You can rotate video by 90° or 180°, clockwise or anticlockwise. It provides a dual view interface to compare input video with its output after rotation. This video rotator rotates full video by selected degrees. You can also flip video vertically, horizontally, left to right, and right to left. You can check the shortcut keys available for each function in Options menu. It supports various video formats like AVI, FLV, MP4, GIF, MKV, 3GP, WEBM, MPG, etc., as an input. But, to save the video after rotation, it only supports AVI, GIF, MKV, and MP4. Also, to save video in its original format, you will have to upgrade to its paid premium version. This freeware is a basic video rotator with an easy-to-use user interface. Easy Video Maker is another freeware that is a good video rotator as well. To rotate a video, drag it to the timeline, right-click on video, go to Rotate, and arrange the settings as desired. You can rotate a video by 90°, 180°, or 270° (clockwise/anticlockwise). You can use shortcut key Ctrl+Alt+R to quickly fix settings for video rotation. You can only rotate the full video in it, and not a selected part. You can also flip a video horizontally. You can set the output video format by going to Settings option. It lets you select various parameters to save your video, like format, quality, 3D smoothing, audio bitrate, etc. To save the rotated video, use Render option. It supports output formats like: AVI, MP4, FLV, WMV, OGG, MKV, MOV, MPG, TS, ASF and 3GP. It is basically a video editor which supports all common video file formats, such as AVI, MP4, MPEG, WMV, FLV, MKV, DivX, XviD, etc. It provides various tools to edit videos, like trim, cut, split, mix, join, resize, crop, merge, zoom (in/out), rotate, stretch video, speed (up/down), and more. Openshot is yet another powerful video editor which is also a good open source video rotator. You can rotate your videos by 90° or 180° clockwise and anticlockwise. Just import the video file to the program, drag it to the timeline, right-click on it, go to Rotate, and select the desired option to rotate it. It rotates full video, not a particular part. To export the rotated video, you can customize some settings. You can fix its width and height, aspect ratio, pixel ratio, frame rate, video settings, audio settings, etc. You can save output videos in formats like: MP4, AVI, MOV, MPEG, OGG, FLV, WEBM, etc. Openshot offers numerous tools to create impressive videos by adding different effects, animated transitions, subtitles, trimming videos, and much more. It supports a good range of common video formats to import to the program and edit. Shotcut is a free video editor which lets you rotate a video. You can manually rotate videos by any degrees, clockwise. To do so, go to Filters > Rotate and manually fix the parameters for rotation. You can set the Scale, X offset, and Y offset for rotated videos. You can even use progress bar to set each parameter. Using Shotcut, you cannot rotate a specific part, but the whole video. Shotcut supports a wide range of video formats that it can rotate, like AVI, MP4, MPEG, WMV, MKV, and many more. You can export rotated videos in formats like: MP4, AVI, MPEG, OGG, WMV, FLV, 3GP, M4V, MKV, ASF, SWF, and many more. Some of its great features include adding stunning visual effects and transitions, waveform caching, thumbnail caching, frame-accurate seeking, multi-format timeline, audio recording, webcam recording, 4K support, network stream playback, trimming videos, and many more. HD Video Converter Factory is another software to rotate videos. You can rotate a video in increments of 90° clockwise or anticlockwise. To do so, add a video file, click on the option highlighted in red in above snapshot. A dual-view window opens up where you can find rotation feature (highlighted in black in above snapshot). You can rotate video while comparing it with the original one. The rotations can be applied to whole video, not a specific part. You can also flip video vertically or horizontally. It also provides some basic editing options like adding few visual effects to videos and trimming a section of a video. You can also set some other settings for the output video like resolution, quality, frame rate, aspect ratio, etc. It supports a wide range of video formats to rotate, like WMV, MP4, MPG, OGG, FLV, WEBM, DIVX, AVI, and many more. To export a video, it supports formats like: MP4, MKV, AVI, DIVX, MPG, 3GP, MOV, VOB, ASF, M4V, TS, MTS, M2TS, DV, XVID, and some more. It supports popular audio formats too. It is basically a video converter, which can convert dozens of video formats in HD quality. It can be used as a video rotator as well as a basic video editor. It can also be used as an audio extractor. Avidemux is a free video editor which you can use to rotate videos. It lets you rotate videos by 90°, 180°, and 270°, clockwise. To rotate video in Avidemux, go to Video > Filters > Transform > Rotate and right-click on it and select Add. Now, choose the angle to rotate the video. You can add multiple rotations to a video one by one. Sadly, you cannot rotate a specific part of video in Avidemux. You can also flip videos (horizontally or vertically). This video rotator is a freeware for Windows. It supports a good range of video formats to import and export, like: FLV, AVI, MP4, MPG, MKV, etc. It is a video editor to edit and create stunning videos. It provides options to adjust color tone, reduce noise from videos, sharpen video edges, cut, copy, and paste video parts, crop, fade, etc. It also allows you to add music files, like: MP3. AC3, AAC, etc. to videos and apply various audio filters as well. It even allows you to add subtitle files like SSA, SRT, etc. to your videos. Vidiot is a portable video rotator. You can rotate a video in any angle using the slider available in this software. To do so, add a video file, go to Timeline, click on the video, and go to Rotation option. It rotates the whole video. It also shows the preview of output video in another section while rotating a video. To save the rotated video, go to Sequence > Render Settings, and click on Ok & Render now. In Render Settings, you can select a destination folder and output format. It supports output formats like: MP4, FLV, MOV, MPEG, OGG, AVI, MKV, F4v, M4V, and some more. Vidiot is basically a video editor which lets you edit a video by resizing, cropping, changing its speed, etc. It supports a good range of media files like audio, video, and images. You can create a project using different media files. Altarsoft Video Converter is another video rotator for Windows. You can simply add video files or a video folder and rotate them. You will find the Rotate feature at the bottom of its interface (highlighted in pink in above screenshot). You can set the rotation angle by using the slider provided and see the preview while rotating a video. It rotates a video clockwise. You can rotate multiple videos and a folder of videos at a time. The rotation is applied to whole video using this video rotator; You cannot select a specific part of video to rotate it. It supports same input and output video formats, like: AVI, ASF, WMV, and MPG. It is basically a video converter with a simple user interface. You can even apply some basic editing to videos, like changing color tone, zooming (in/out), selecting video and audio codecs, etc. XMedia Recode is another video rotator software for Windows users. Once you add a video file, go to Filter/Preview section > Add Filter > Rotate. Now, click on Rotate option, you will see options to rotate video. You can rotate a video in intervals of 90 degrees (clockwise/anticlockwise) or choose Adjust rotation option to manually set the degrees of rotation. Not one, but you can rotate multiple videos at a time. You can also select a fill color of your choice. This portable video rotator rotates full video, not a particular portion. It supports a good range of input and output formats of audio and video files, like Mp4,MP3, MP2, MKV, FLV, 3GP, MPEG, MOV, and many more. You can save a video using Encode option. Using this software, you can convert a video to another format. It also lets you make basic edits to a video, like trimming a video clip, cropping, resizing, adding a subtitle file to a video, and etc. It is a portable software. You need not install it; just download its .exe file and run it. Windows Live Movie Maker is another software to rotate a video. You will find Rotate option in Editing tools in Windows Movie Maker. Using this option, you can rotate video in intervals of 90° (clockwise/anticlockwise). Unfortunately, you cannot rotate a specific part using it. To save a rotated video, use Save movie option. You can import videos like AVI, MP4, WMV, MKV, MPEG, etc. for editing. But, it lets you export rotated video in MPEG and WMV formats only. You can also share the video on YouTube, Vimeo, Facebook, etc. Movie Maker is a very easy-to-use video editor which can be used as a video rotator. It lets you create great videos by adding predefined movie themes, visual effects, animated transitions, etc. There are many other basic video editing tools which you can use to trim the videos, split a video into multiple parts, change video orientation, merge multiple videos into one, and more. It also provides a feature for Video Stabilization to apply wobble correction and anti-shake to the videos. This means you do not have to use more complicated free video stabilization software. This video editor also allows you to add audio files (WAV, OGG, MP3, etc.) to your entire video or to any specific section. VLC media player is a popular video player which can also be used as a video rotator. Transform: Using this option, you can rotate video by 90, 180, or 270 degrees clockwise. You can also flip video (horizontally/vertically) or transpose video. Rotate: This option lets you rotate video by any specific degrees. But, it cuts out the edges of video that are lying outside original video frame after rotating it. The steps to save rotated video are as important as applying transformation. To save the rotated video, go to Convert/Save option in Media menu (or press Ctrl+R). Here, you will have to browse and add the input video file again that you have to rotate. Now, click on Convert/Save button. This opens a new pop up window. Here, click on Edit selected profile option available in front of Profile dropdown. Again in the new window that opens, go to Video Codec tab, then go to Filters tab. In the Filters tab, if you have chosen Transform option to rotate video, enable Video transformation filter, else enable Rotate video filter. Click Save, then select the destination folder, and click on Start to save the rotated video. Rotating a video in VLC Media Player is easy, once you get a hold of it. If you get used to it, you might not need a video editor to rotate video. Note: Once you have applied rotation to a video, you will have to go again to Tools > Effects and Filters to revert back the rotation setting to normal, else other videos that you play, will open with rotation. Another quick way to reset the Rotation preference is by going to Tools > Preferences, then resetting Preferences. But, this will reset other preferences along with rotation settings, so be careful. Free Video Editor is basically a freeware to edit videos which also lets you rotate video. You can use rotation tool to do so. You can rotate only the whole video by 90, 180, or 270 degrees. Also, you may use shortcut key R to do the same. It is a freeware for Windows which provides limited functionalities of a video editor. It supports common video formats to import, but to export videos, it supports MP4, AVI, MKV, and GIF only. It lets you trim a video, invert a selected part, zoom in/out, etc. WinFF is another free software which can be used as a video rotator. It allows you to rotate video by 90 degrees Left, 90 degrees Right, 90 degrees Left + Vertical Flip, and 90 degrees Right + Horizontal Flip. One of the unique features of this software is that you can also rotate multiple videos at once. It supports various video file formats such as MPEG, AVI, WMV, etc. to import and export. FFMPEG is a well known command line video utility software, which can be used to rotate videos. It lets you very easily rotate video. Open Command Prompt and navigate to the folder where FFMPEG is installed. Once you run the command, the rotated video will be saved in the same folder. Isn’t it very simple to rotate video in FFMPEG? You can carry out various other video related operations in FFMPEG, and it also supports a wide range of video formats. Checkout the documentation of rotate command to know more. To know more parameters related to rotation and rotate without re-encoding, you can check out this and this link.